For one thing, the NBA Hall of Famer argues that you shouldnt love what you own. Hes followed that advice in his post-basketball serial entrepreneur career. Magic Johnson (with TD Ameritrade Institutional's Kate Healy looking on) works the room at TDAI LINC 2015 in San Diego. 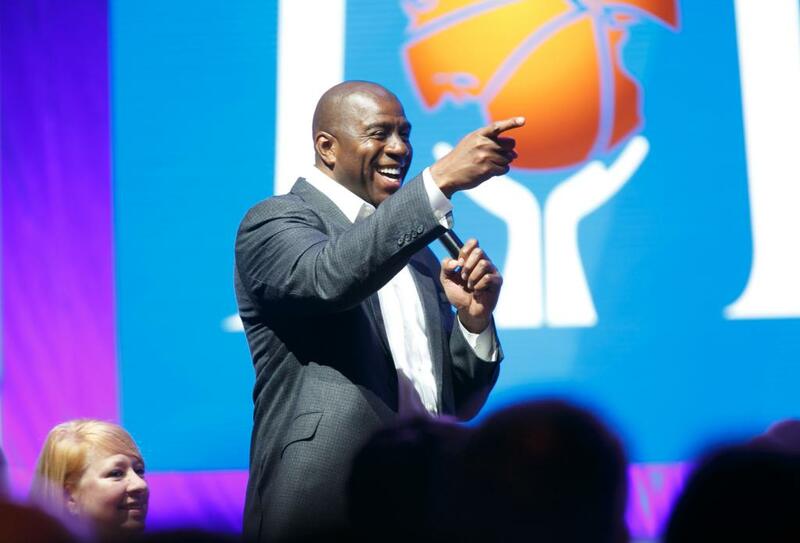 Magic Johnson charmed the audience last Friday at TD Ameritrade Institutional’s annual conference in San Diego. He first called on the attendees to “please help out as many professional athletes and entertainers” that they could, counseling them not to “spend more than you make.” He joked that he wished he could have attended “this conference when I started playing” professional basketball and encouraged the advisors in the audience to “invest in urban America,” much as Johnson has done in his post-basketball business career. As the thousands of attendees ate lunch, Johnson told stories about his playing days and his ongoing successful business days. Roaming the stage and floor, he brought forward a number of individual listeners for a moment in the spotlight—asking their names and where they came from, and pausing for them to take selfies with Johnson or have a friend snap a photo. That led to multiple stories about Bird — pausing to remind his audience that in that 1979 game “we took down the Bird” — but also saying “your competitor can make you better; Larry Bird made me better” when Bird’s Boston Celtics beat Johnson’s Los Angeles Lakers in seven games in 1984. Spurred on by that loss, Johnson said he went back to the gym in the off-season and worked harder than he ever had, with the result that the Lakers beat the Celtics in six games in the 1985 NBA Finals. One Johnson story: He said he was in the locker room at the 1998 NBA All-Star Game preparing for the 3-point shooting contest when Bird called for attention and said, “Which of you will be coming in second?” Then Bird went out and won the contest with his final shot, turning around while the ball was still in the air and walking away, knowing it would go in. “What person says that?” Johnson marveled. As for his business career, Johnson said that when he was leaving basketball, he asked for and received a list of Lakers’ season ticketholders. He then started cold-calling the heavy hitters on that list, inviting them to lunch, where he picked their brains on how to be successful in the business world. Along with Lakers owner Dr. Jerry Buss, several other business and entertainment luminaries came to serve as Johnson’s mentors, including Peter Guber of Columbia Pictures. In addition to picking other successful entrepreneurs’ brains, Johnson said he did plenty of research on his own to find business opportunities. So when he learned that the African-American and Hispanic-American communities each has more than $1 trillion in spending power, he decided to do his part “investing in urban America.” His ventures included a partnership with Howard Schultz of Starbucks to first launch three Starbucks in minority neighborhoods, with the option to build 175 more. That expansion happened after the first three stores delivered impressive revenue, and eventually Johnson sold back the stores to Schultz around the time he sold his part-ownership in the Lakers. “You can drive ROI in urban America,” Johnson says of his company, Magic Johnson Enterprises, whose holdings include a real estate fund that owns multiple hotels, including the Washington Hilton and W hotels in Austin, Texas and Hoboken, New Jersey; a private equity fund; Inner City Broadcasting Corp.; and more. Johnson boasted of a food service business that now supplies both Disneyland and Disney World. A group led by Johnson, who has a personal net worth estimated at $500 million, purchased the Los Angeles Dodgers for $2 billion in 2012. While some advisors after Johnson’s presentation said they wished he had spoken more about some of his business setbacks rather than regaling them with his success stories, this was one sports personality whose words resonated with advisors.